A D Metro’s unique ULTRA touch screen is the most economic, durable and reliable resistive touch screen sensor available on the market. What differentiates ULTRA is its patented durable glass surface that is scratch, abrasion and chemical resistant. It combines the characteristics of a durable glass surface with the benefits of a resistive touch screen. ULTRA offers performance characteristics that are ideal for wide range of commercial, industrial and military applications where rugged durability and reliability are required. 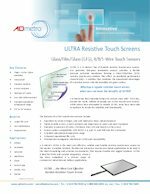 ULTRA overcomes the traditional limitations of standard resistive touch screen sensors with its durable borosilicate glass surface, rather than the standard traditional polyethylene surface. The hard glass surface is resistant to scratches and abrasion, impervious to most chemicals and waterproof. 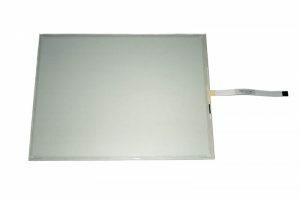 Its glass surface is suitable for IP67 and NEMA 6 enclosures. As a pressure activated touch screen it can be reliably operated by finger, any glove or stylus; and even with contaminants on the screen, such as rain, oil, grease, food, dirt and dust. ULTRA’s construction allows it to be used over an extended range of operating environments; and it offers unparalleled reliability, that has been tested to over 200 million operations. These characteristics make ULTRA ideal for reliable operation in harsh environments including rugged, outdoor and unattended kiosk applications. Ultra offers easy integration into many applications. Its immunity to EMI enables easy integration with any type of display and without compromising touch sensitivity. Its compatibility with standard resistive controllers, offering USB-HID support, enables rapid product development and accelerates time to market. For less demanding applications see A D Metro’s Standard Resistive touch screens. Impervious to water, chemicals, solvents, etc. *Technical specifications apply to standard products and are subject to change without notice. Product performance will be subject to suitable installation and mounting. Consult manufacturer for technical drawings, best practices for installation and mounting, confirmation that product can meet intended application’s requirements or for the applicable product specifications when optional enhancements are applied. 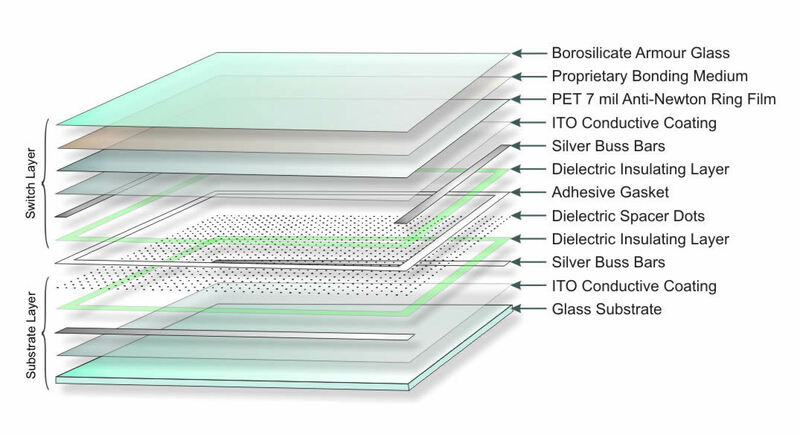 ULTRA’s Glass-Film-Glass (GFG) constriction adds a borosilicate glass membrane that enhances the touch screen sensor’s operational life, reduces ITO fracturing and pillowing by creating a stiffer glass/polyester top layer. It also extends the operational temperature range with better matched coefficients of expansion. The glass/polyester top layer does not shatter, or result in spalling, and allows the sensor to continue to operate even after extreme abuse such as deep scoring, repeated impact trauma and other forms of vandalism. 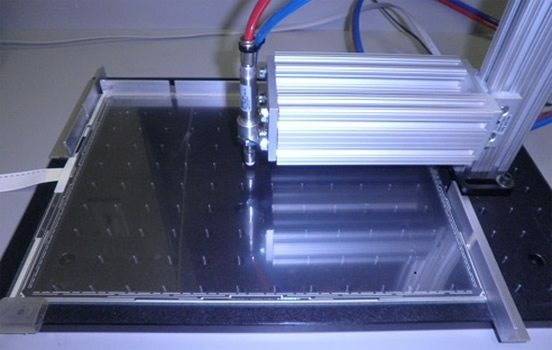 The 5-wire ULTRA resistive touch screen sensor has been tested beyond 200 million touch operations on a single point with a “Thumper Test” and without any failure of the sensor. How do ULTRA Resistive Touch Screen Sensors Work? An ULTRA resistive touch screen sensor works in the same way as a resistive touch screen sensor. A resistive touch screen sensor is an analogue switch technology that is pressure activated. Two conductive coated layers (usually using Indium Tin Oxide [ITO]), facing each other, are separated by a layer of dielectric spacer dots. When pressure is applied to the top surface, the two layers come into contact and the controller locates the touch point. To determine the x and y coordinates, in 4- and 8-wire sensors a voltage gradient is applied to each layer in turn; and in 5-wire sensors the resistance is measured between the top layer and each of the four corners of the base layer. For more information on popular touch screen technologies, please download our whitepaper.